Rapid developments and unregulated changes are also taking place outside urban centres and in rural areas. Planning interventions are required to facilitate planning and development of settlements that are safe, comfortable and convenient places to live. Therefore, this Division will prepare general guidelines, facilitate and regulate planning and development in these areas and primarily look at the preparation of regional and valley level development plans. The main objective is to ensure a more holistic and coordinated planning approach and to enable sharing the use of infrastructure services, amenities resources between an urban centre and its surrounding regions. 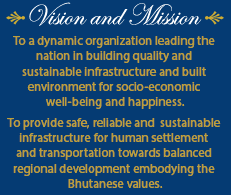 The Division will also carry out study of the traditional villages and their settlement patterns and the architecture of Bhutan and consider how these features can be promoted and incorporated into the settlements that are being planned and developed.